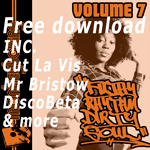 Yes, you read that right – Soul Flip Edits 5 coming out after Soul Flip 6 (don’t ask!) and it’s guest producer time again as the label welcomes a man who possesses no small measure of vision when it comes to funky beats – DJP. It’ll be the glasses. 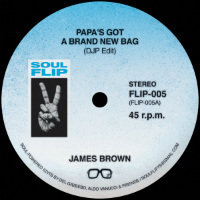 And damn if he doesn’t see his way to making the Godfather of Soul’s Papa’s Got A Brand New Bag seem like it’s got – well – a brand new bag. And then as if that didn’t require brass balls enough, he takes on the biggest cut by another soul legend, Eddie Floyd. No need to knock on wood for that either though as he revitalises it with a great big driving breakbeat.